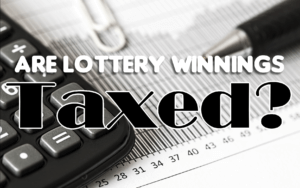 Are Lottery Winnings Taxed? Yes and no, it depends! You’re doing your happy dance because you won the lottery! Cha-ching, cha-ching…now I can buy some bling! Hold on, before you start spending, wait to get your check from the lottery organization. Depending on where you live, you could be looking at a sizeable tax deduction! In this quick-guide to lottery taxation laws around the world, find out how much of your lottery winnings (if any) go back to the government. The taxman (tax person to be gender correct) or America’s Uncle Sam (there’s no feminine equivalent, yet) is drooling to grab 37% of your jackpot, if this puts you in the top tax bracket. The top federal bracket effective January 1, 2018 is 37% for an individual making $500,000+. So, if you bought your ticket in New York, your $1,000,000 win is going to be reduced significantly—minus 37% (federal taxes), minus approximately 8.82% (state taxes) and minus an additional 3.876% (municipal tax). Yessiree, New York is a high tax state! States that have no state income tax are Florida, South Dakota, Texas, Washington, and Wyoming. States that have income tax but do not tax lottery winnings are California and Delaware. Let’s move on to America’s neighbor up north–Canada. Lotteries are free from income tax in Canada but that’s if you bought and won a Canadian lottery ticket. If a lucky Toronto resident won the US Powerball, Uncle Sam will take a chunk out of the jackpot winnings. Across the pond, the UK government doesn’t consider lottery winnings as income, so they are not taxed. But there are other tax issues worth considering, such as an income tax, inheritance tax, and interest gained. Lottery winnings in Australia are not treated as personal income but a purchase made from a jackpot win may be considered as capital gain which must be declared on a tax return. The same holds for New Zealand and may be further subject to local laws. Moving on to the EU. Most of the European countries tax winnings at the source–meaning taxes are deducted by the lottery organization and the local and national government where the lottery takes place. So, the amount of money deposited in your account is post-tax and 100% yours! There are different “tax bands” or brackets of taxation based on how much you won. Italy’s SuperEnalotto will hold back 12% of any winning over €500 while no taxes are deducted for any win under €500. The tax used to be 6% but was changed in October 2017 to generate more revenue for the government. The bottom line if you win a large jackpot is to consult with a reputable tax professional and lawyer immediately! Tax laws change and money flowing across international channels can be tricky. Have the lottery organization explain in writing if they withheld money. And lastly, don’t worry, be happy! You are richer now than you were yesterday!